RAW HOLLYWOOD : TREY SONGZ RESPONDS TO KEKE PALMER'S ACCUSATIONS, SAYS "BABYGIRL BUGGIN. POINT BLANK PERIOD"
TREY SONGZ RESPONDS TO KEKE PALMER'S ACCUSATIONS, SAYS "BABYGIRL BUGGIN. POINT BLANK PERIOD"
KeKe Palmer put Trey Songz on blast after she says that he secretly filmed her for his music video "Pick Up The Phone" featuring Fabolous. She took to social media to let the world know that it was disrespectful to be filmed after saying declining numerous times. 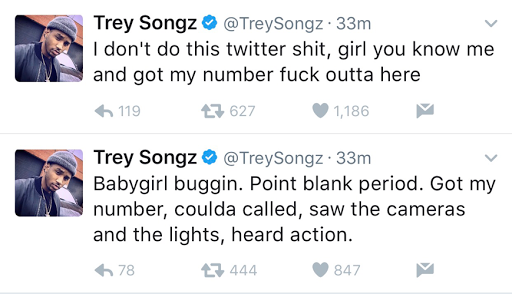 After catching wind of what was said about him, Trey Songz jumped on twitter to return the favor & is saying that Palmer knew that she was being filmed. Find out what KeKe had to say HERE.